ABC/Jeff Neira(LOS ANGELES) — Dawson’s Creek alum James Van Der Beek shared an emotional Instagram post describing the painful experience of his wife’s three miscarriages. “Many couples become closer than ever before. Many parents realize a deeper desire for a child than ever before. And many, many, many couples go on to have happy, healthy, beautiful babies afterwards (and often very quickly afterwards — you’ve been warned?? ),” he assured. 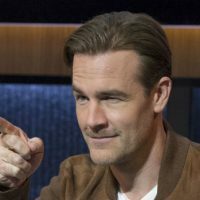 Van Der Beek’s post came just days after his wife Kimberly used her Instagram account to talk about her journey to expanding her family. She shared her truth because she was what she called “bone tired,” but still grateful for her family and wanted to show others that everyone has rough days. In addition to Gwendolyn, the Van Der Beeks are also parents to Emilia, Annabel Leah, Joshua and Olivia.